A new joint research project from Massey University, University of Canterbury and GNS Science is looking to forecast, for the first time, the hazards associated with collapsing volcanoes, that could save infrastructure and lives. Project leader Dr. Gabor Kereszturi from Massey University says New Zealand currently does not have a model in place to forecast thesecomplex events. "Volcanoes progressively weaken and may collapse without warning through hydrothermal alteration. These dangerous mass wasting processes occur less-frequently than eruptions or lahars but the resultant mass flows can be large in size, posing risk to local residents, and businesses." "Collapses are often multi-hazard events, with even small-scale landslides capable of triggering eruptions or creating break-out lahars. Consider the Mount St Helens eruption in 1980 which caused the entire weakened north face to slide away, creating a large landslide. Or the eruptions on the Upper Te Maari Craters on the northern side of Mt Tongariro in 2012, which caused small lahar/debris flow from near the eruption site down to State Highway 46. "These kind of events demonstrated the greater need to understand and assess this process and its role in the volcanic hazard scape," he says. Funded by the Natural Hazards Research Platform, the research, Too big to fail? A multidisciplinary approach to predict collapse and debris flow hazards from Mt. Ruapehu, seeks to establish a new critical remote sensing tool to understand and mitigate downstream hazards from debris flows and the susceptibility of the population, infrastructure, and resources to these hazards. This project applies new advanced hyperspectral imaging, aero-magnetic surveys and field sampling techniques to map volcanoes on the surface and at depth below. This research utilises airborne surveys with a fix-winged aircraft, mounted with Massey University's state-of-the-art hyperspectral imaging system and a digital camera combo to provide topographic and spectral datasets for mapping and modelling. This system under trial in this project is the first and only imaging system of this kind in New Zealand, and one of the few in the Southern Hemisphere. 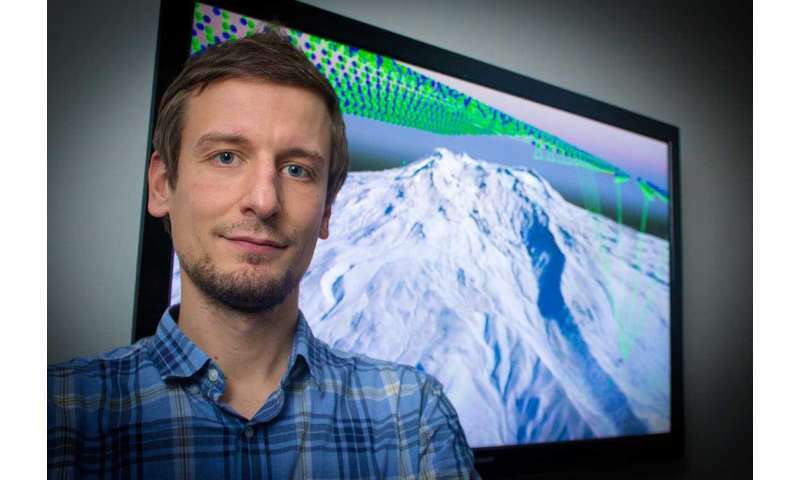 Dr. Kereszturi says this will vastly improve how we visualise, understand the volcano geology, and improve pre-disaster mitigation efforts around active volcanoes. And the fusion of these advanced techniques has never been attempted in New Zealand or internationally. This will allow us to apply new numerical models and simulation to map volcanic hazards from flank collapses. 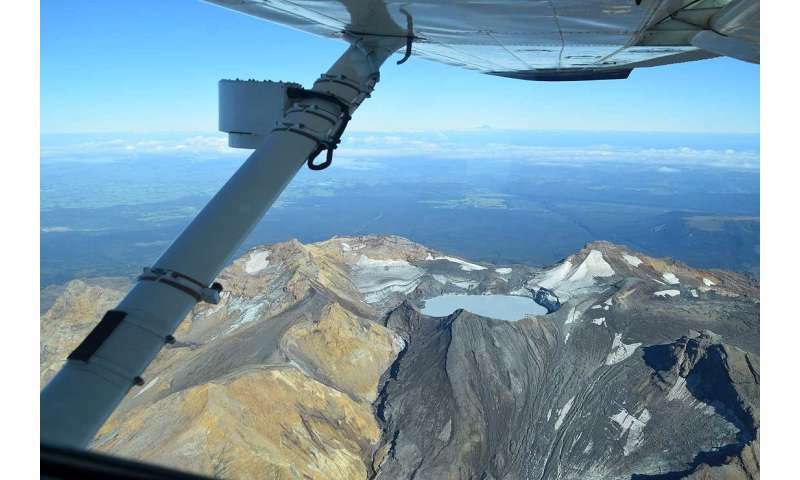 Mt Ruapehu has been chosen by the research team as a case study, for its well-developed hydrothermal alteration zones, which make it prone to instabilities across a range of scales. However, the research methodology can then be applied on a national scale to Mt Taranaki, Mt Tongariro, Mt Tarawera, White Island and at geothermal areas like Hipaua near Lake Taupo. "This project will not only substantially improve the capability of New Zealand to assess flank collapse and debris flow hazards at Mt Ruapehu, but also develop new skills and extend technological capacity that will benefit many end-users spanning across multiple sectors, and will be incorporated into stakeholders' hazard and risk management planning."